On February 20-21 2014, DU Law students competed at the National Environmental Law Moot Court Competition hosted by Pace University School of Law in White Plains, New York. The team was composed of third-year law students Laurie Strong (a black belt in kung fu) and S*tefanie Arndt* (a U.S. Marine), and second-year student Alexandra Hall (a chemical engineer). Coached by Professor Kelly Davis (fellow at DU’s Environmental Law Clinic), the team members were the top performers at the DU Environmental Law Moot Court Competition held in September 2013, earning the highest scores based on a brief and oral arguments. The team continued DU’s long tradition of competing in the annual competition, which this year drew nearly 80 teams from law schools around the country. The team represented three fictional parties in a Clean Water Act case, which required them to prepare arguments for each party on issues ranging from the scope of the Act’s citizen-suit provision to the determination of point sources and navigable waters. The team prepared a brief with no outside help in November 2013, and represented all three parties in oral arguments at the competition. They demonstrated a commitment to teamwork as well as superb knowledge of environmental law and appellate procedure at the competition. “I really enjoyed the experience of representing DU at NELMCC. 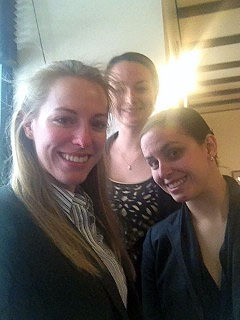 Working with Prof. Davis, Stefanie, and Laurie was educational and fun,” said team member Alex Hall. Ms. Hall looks forward to participating in DU’s competition next year and hopes to compete at NELMCC again in 2015.